Once the onions have been separated from their roots, they are windrowed in the field. In Hokkaido, they use very small equipment that enables the beds to be placed very close together. In Hokkaido, onions are harvested once the plant has completely wilted and the bulb is physically ripe. Fully matured onions, ready to be harvested. 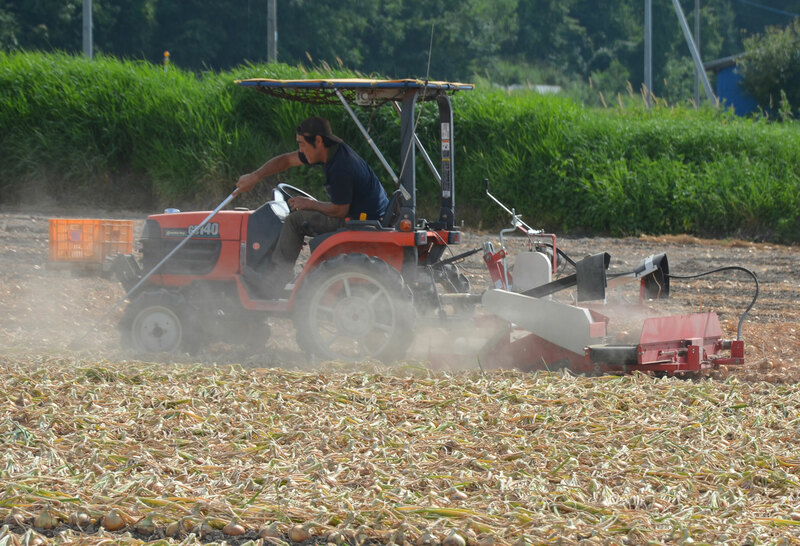 Very small tractors are used with a simple device that digs into the soil just below the root system of the onions. 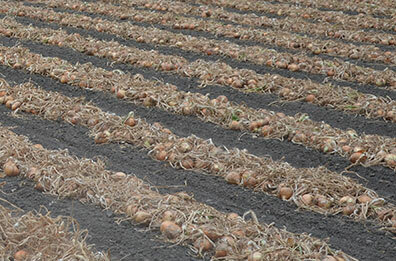 The onions are windrowed with a small windrower, removing the onions from the ground and placing them in rows. These windrowers have a transportation belt at the back. This belt can be rotated, as shown in the picture above. 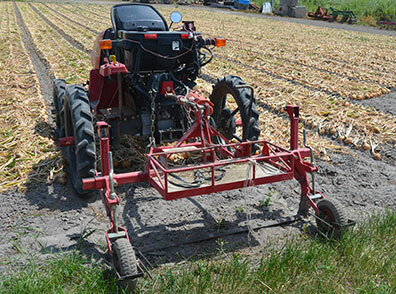 In this configuration, not using the transport belt, the onions are lifted out of the soil and placed back in the middle of the same bed. The result of the first pass with the windrower in this configuration can been seen in the next picture. HOWEVER, when the onions are left in the field like this, the onion loader has no space to manoeuvre. 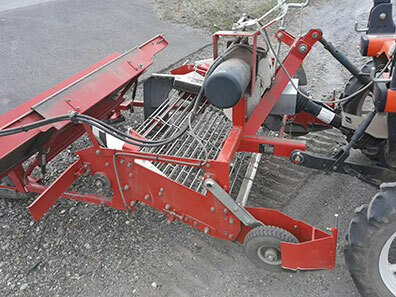 The onion loader is used to load the onions from the field into storage boxes. How is space created for the onion loader to manoeuvre? The onions are windrowed a second time, but this time the windrower is set up differently. The transport belt is turned horizontally and the onions windrowed in one bed are placed onto the windrowed onions on the adjacent bed. This creates alternating beds with empty rows in between. The end result is a perfectly organised field with onions ready to be loaded into the storage boxes. Windrowed onions in Japan, ready to be loaded into storage boxes. This yields three to four percent more onions per hectare than in Europe.